Saint Vasilii, Bishop of Zakholmsk, was born of pious parents in the XVI Century in the Popov district of Herzegovina. At the age of maturity he left his parental home and settled in the Trebinsk monastery in honour of the Uspenie-Dormition of the MostHoly Mother of God, and became a monk. For his virtuous life the saint was elevated to bishop of Zakholm and Skenderia. He occupied the bishop's cathedra-chair in the 2nd half of the XVI Century, successor to bishop Paul and predecessor to bishop Nikodim. 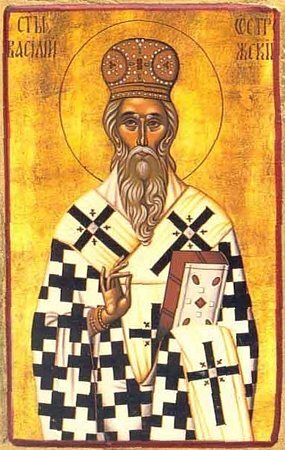 Saint Vasilii was a good pastor of the flock of Christ, and the Lord strengthened his discourse with various miracles. For the sanctifying of soul with the wisdom of holy ascetic fathers, the saint journeyed to Athos. Saint Vasilii died peacefully and was buried in the city of Ostrog in Chernogoria on the border with Herzegovina.